Poppy Hills was blessed to be a co-host to what is now known as the AT&T Pro-Am event from 1991 -- when it replaced Cypress Point -- up until 2010, when Poppy Hills was replaced with the current co-host, Monterey Peninsula Country Club. Now here we are, each year the tournament generating nearly $12 million for local non-profits in Monterey, Santa Cruz, and San Benito Counties. We wrote a blog back in 2017 touching on some common questions, but figured it would be a good idea to start up the conversation again as we move into 2019. #1: Are you ever going to get the Pros back? The honest answer here is that you never know. The publicity gained from an event like this is mensurable, and we were very fortunate to have had the event at Poppy Hills. As of now, Monterey Peninsula Country Club has a contract through 2019. There is still speculation which course will be the third host after this year. Many think it may be the newly renovated Dunes Course at Monterey Peninsula Country Club. Only time will tell whether we'll get the Pros back, but if it was up to me I’d welcome them with open arms. #2: Did Poppy Hills renovate for the purpose of getting the AT&T Pro-Am tournament back? No. This is probably the most common misconception. There were 3 key factors for the renovation. #1 - Save Water - With water on the Monterey Peninsula being some of the most expensive in the United States, serious changes were needed if our organization wanted to continue to thrive while keeping our member fees as low as possible. Eliminating 25 acres of irrigated turf provided the solution we needed. #2 - Improve Drainage - If you’re a fan of the tournament approaching you’ve no doubt heard of the “Cosby Weather.” The old Poppy Hills couldn’t handle the downpours and we were left with conditions that were very hard to recover from within a short time period. This may or may not have been a big part of why the tournament left Poppy. However, needless to say, it didn’t help. #3 - Modernize the Layout - Golf in 1986 looked a lot different than golf today. The NCGA is committed to being the leaders in the industry, so the layout update was perfectly timed with the water savings and drainage improvement goals. Our new layout, if you haven’t experienced it yet, is all about the ground game. You’ll find firm and fast conditions and your putter will be your best friend. Leave the sand wedge in the trunk, and wear your creativity hat because that is the secret to success when navigating the Poppy Hills trail. #3: What other events is Poppy Hills looking to host? 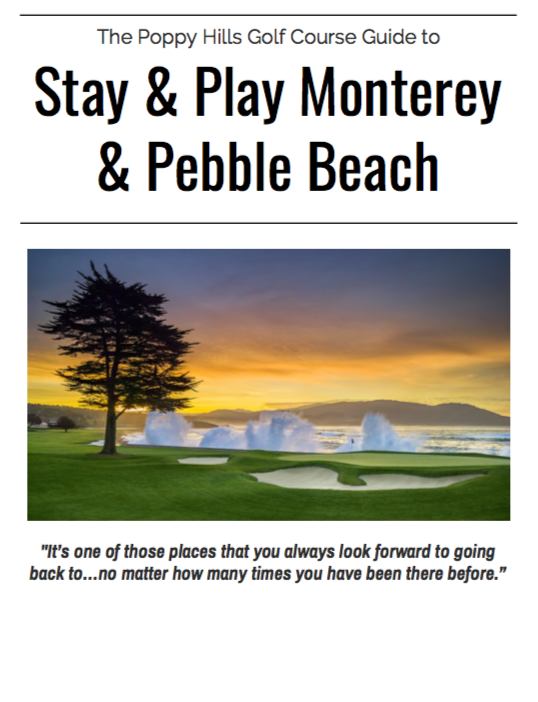 We are committed to a long-time, great relationship with the Pure Insurance Championship as co-hosts with Pebble Beach Golf Links and the PGA Champions Tour. The senior tour loves the new Poppy and we love sharing it! In 2019, the event will take place September 24-29, so mark your calendars now! The Northern California Golf Association has scheduled 20+ tournaments for 2019 -- open to all NCGA members to test their skills against their peers. See a full schedule here. Poppy Hills is also home to the St. Mary’s Invitational, which attracts many of the top collegiate athletes for three days of competition at Poppy Hills every November. We also have our eyes on attracting an NCAA Regional and hopefully a National Championship in the future. If you’re like me, nothing makes you want to hit the links more than watching a day of others enjoying the game. We have tee times available all week while only a few miles away from the action. Click the link below or call (831) 250-1819 to book a tee time. Reserve your tee time at Poppy Hills!